Dimples develops prepress content efficiency systems so you can produce print media with higher cost margins. By adding our patented ink-saving overlays to your publication’s existing font library, you can generate ink savings up to 40% on headlines, body, and other printed text. As part of our Dimples Type service, we generate ink saving overlays for your publication’s existing fonts using patented algorithms. Your publication’s typography does not change — the fonts appear identical to your readers, except the fonts require less ink to print. Publisher provides the fonts commonly used throughout the publication. This includes fonts used for headlines, bylines, body, and other content, excluding advertisements or artwork. Dimples generates ink-saving overlays for the fonts using our patented process. Dimples tunes the overlays to deliver the savings ideal for your publication. Publisher installs the ink-saving font overlays on the systems used for digital layout of the publication. Publisher updates the stylesheets within the relevant software (e.g. Adobe inDesign or QuarkXPress) to point to the dimpled overlays. The Dimples Type service fee is tied to the publication’s advertised circulation, and is based on a percentage of the estimated savings realizable by the publisher. 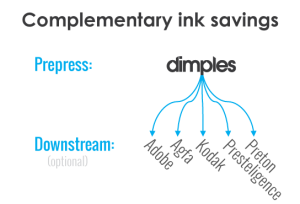 Already have an ink optimizer? Excellent. Dimples complements downstream ink optimizers, if you have any in place already. Dimples preserves the outlines of each printed glyph in bodies of text, maintaining legibility while delivering ink savings with less run off and show through. Your original un-dimpled fonts remain available for use as well, such as for advertisements. Your publication’s typography does not change — the fonts appear identical to your readers, except the fonts require less ink to print. gain flexibility on savings level and paper/ink quality. Dimples is a prepress font-based ink saving solution that applies perforations — or dimples — to the fonts in publishers’ font libraries. When saving ink with Dimples, it's like printing money.